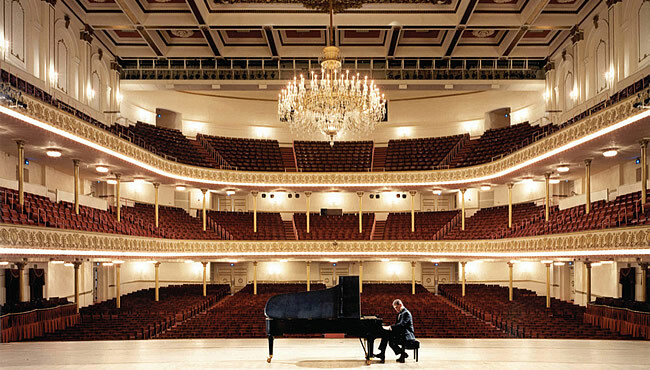 Last week Cincinnati Music Hall announced plans for a $125 million renovation beginning in 2016. The massive Cincinnati Music Hall was completed in 1878. The auditorium boasts over 3500 seats and is only one portion of the overall complex, which includes a 20,000-square-foot ballroom and smaller event rooms. A tremendously important building in Cincinnati culture, Music Hall has been home to the Cincinnati Symphony Orchestra since 1896 and the Cincinnati Opera since 1972. It was also the location of my mom’s high school graduation ceremony. 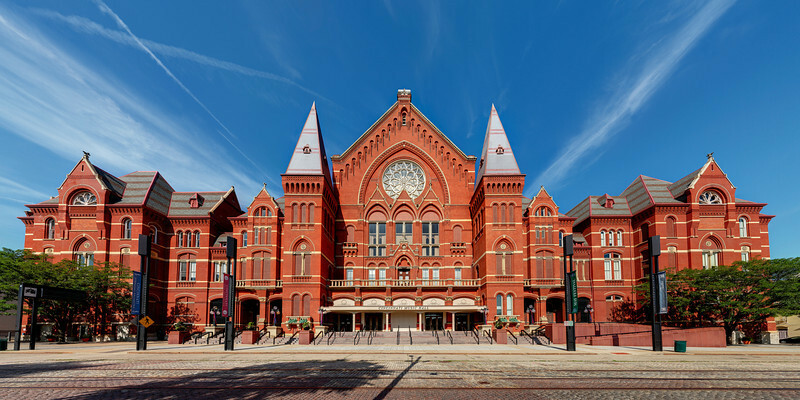 The history of Cincinnati Music Hall might be of particular interest to St. Louisans in light of the fact that just a few years after Music Hall opened its doors, St. Louis constructed a competing building. When Post-Dispatch journalists reported on an architectural competition for the new St. Louis Exposition and Music Hall in 1883, the Cincinnati Music Hall was referenced—for its perceived flaws. 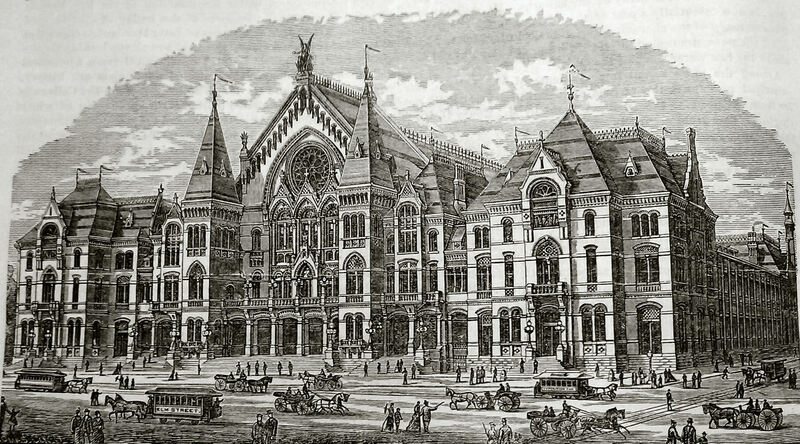 The Cincinnati building featured the music hall at its center with exposition spaces on either side, which seems to have led, in the opinion of some St. Louisans, to an inefficient use of space. The St. Louis planners hoped to prevent a similar situation from happening in their building by requiring that the music hall and exposition hall be built as two separate but connected structures. Conventions were a big business in the 19th century, just as they are today; St. Louis was in competition with Cincinnati and other cities for attracting lucrative conventions and exhibitions of all kinds. Built in only a year, the St. Louis Exposition and Music Hall opened in 1884, though the music hall auditorium took a little bit longer to complete, thwarting plans to host special inauguration events for the Veiled Prophet. The building was located on Olive between 13th and 14th Streets, today the location of Central Library. 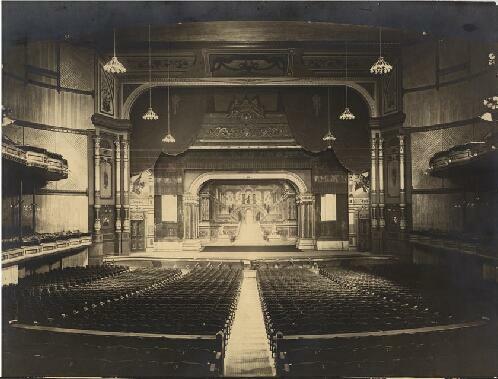 It featured electric lighting and an auditorium larger than the one in Cincinnati. 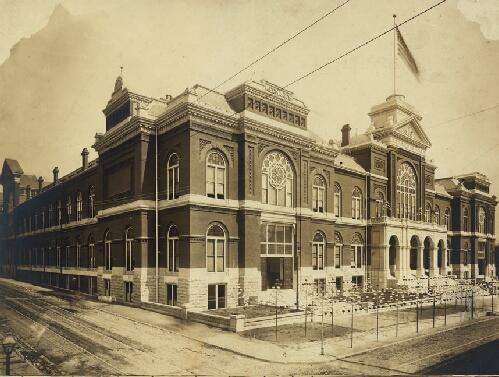 The Exposition and Music Hall would be used by St. Louisans for a little over twenty years until it was razed in 1906. During its run, it would host two Democratic National Conventions: in 1888 (featuring the renomination of President Grover Cleveland) and in 1904. 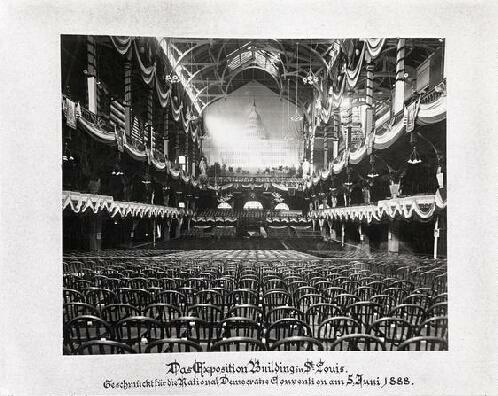 By 1906 the Exposition and Music Hall had been declared unprofitable. Despite widespread objection by St. Louisans about tearing down the building, the building seemed doomed. Andrew Carnegie had pledged $1 million to the St. Louis Public Library Board in 1902 for construction of a city library building. It did not take long for the city to decide that the new library should replace the Exposition and Music Hall. Razing the massive Exposition and Music Hall would also make possible an extension of Locust Street, then one of the most important streets for business in the city. In 1906 the City of St. Louis acquired the association that operated the Exposition and Music Hall and cleared the site. Central Library opened in 1912. The conventions would move west to the new Coliseum at Jefferson and Washington—unfortunately built over the ruins of another great St. Louis institution: Uhrig’s Cave. Today I am reflecting on the survival of Cincinnati Music Hall and the loss of the St. Louis Exposition and Music Hall. They were both very similar in their purpose and their scale. With a short search, I could not find any evidence of Cincinnati Music Hall ever facing a possibility of demolition, perhaps thanks to the stewardship of the Cincinnati Symphony Orchestra. It is interesting to imagine the richness of history and architecture St. Louis would have if only they had managed to maintain older buildings like the Music and Exposition Hall as the city grew. Not all of Cincinnati’s great public buildings have survived—click here to see some great photos of Cincinnati’s lost public library.